Google Chrome is one of the most widely used browser and it provides many new features to it's users. If you want to add a new Metro Style Tab feature just like the Windows 8 Start Screen to Chrome's new tab page than you can try an extension named "new metroTab". Google Chrome is one of the most widely used browser and it provides many new features to it's users. Apart from it's built-in features, chrome extensions also helps users to get some cool features. Developers are working hard to provide the best experience to Chrome users. If you want to add a new Metro Tab feature just like the Windows 8 Start Screen to Chrome's new tab page than you can try an extension named "new metroTab". New Metro Tab is a very good extension for Google Chrome if you want to add metro style live tiles to the Chrome's new tab page. It will look similar to the Windows 8 Start Screen. You can access all your favorite apps, bookmarks and sites in one single tab. It feels really awesome and you should give it a try. After installing the new Metro Tab extension, you will see some default live tiles of sites such as Google, Gmail, Facebook, Twitter, Weather, Calender, installed apps and much more. You can customize almost everything on the new tab page like backgrounds, colors, live tiles, apps, live tiles color etc. If you want add your custom CSS style to design than their is also an options in the options menu. You can add the live tiles of your favorite sites too. You'll just need to add the URL of your favorite sites and the app will generate the favicon, live tiles and feed address from the site automatically. It supports all the popular RSS reader. 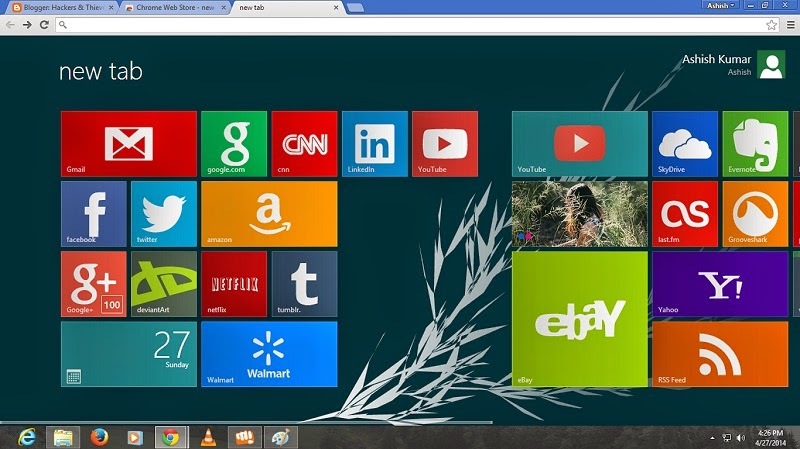 Just click on any tile on the tab and you'll see that the link is opened just like the Windows 8 tile opening Animation. Now you might like to download this new Metro Tab extension for Google Chrome. You can download the extension by clicking here. The link will take you to the new Metro Tab extension page on Chrome Web Store. It is very easy to set up new metro style tab with the help of this extension. You can read belwo some steps to start customizing the new tab page. To open the Options Tab hover over the Avatar located on the right hand site and than click on options to open it. Go to the options and click on Appearance. Here you can change the the name and nick name that is shown on the new tab page. Click on colors to change the styles, colors and background image. Go to Options and than click on live tiles. In the live tiles tab click on the weather and type your city name. 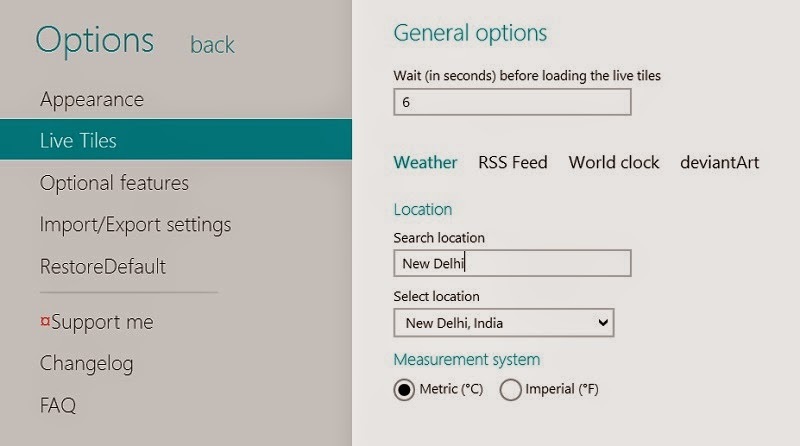 To change your RSS reader live tile Go to Options > Live Tiles. On the live tiles tab click on RSS Feed. From the drop-down choose your RSS reader. For now it only supports Digg Reader and InoReader. That's All. This new Chrome extension to enable metro style live tiles in Google Chrome is really good and you should give it a try. Download the extension from the link given above.